Matpakke is a Norwegian tradition that literally means “packed food”. Every child in Norway takes matpakke to school, most adults continue the tradition into their working lives and if you “går på tur” on Sunday then you are sure to take matpakke with you. It normally consists of several open sandwiches (basically sandwiches without the lid on) and perhaps some fruit and hot toddy in a thermos. Eliot and I have only made matpakke once because we normally get our food supplied at work so last weekend in Hamar, both Line and Anders showed us the process. Above is the result of our matpakke – which one do you think was done by me (Sarah) and which was done by a Line (Norwegian)? 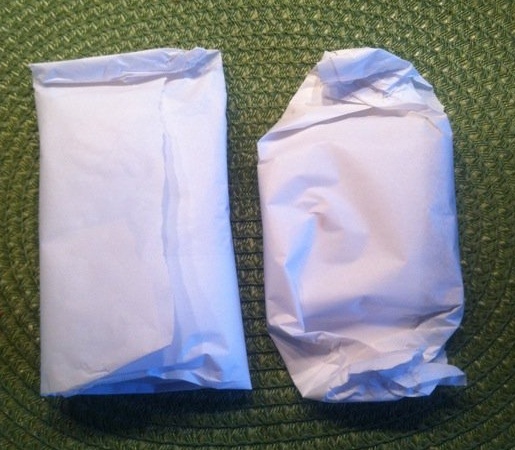 Apparently every Norwegian has their own way of wrapping their matpakke and what you see above is an example of how different they can turn out. Anders is quite skilled at this passtime and demonstrated his methodology on video last weekend. Finally, my friend Liv from choir tells me that this song pretty much summarises the whole matpakke experience in Norway. I’ve added the translated lyrics below for my English friends. Basically the song talks about the difficulty in eating layers of open sandwiches that have been stuck to paper. Brilliant – thanks Liv! It’s no fun to eat this food, when it is in the package and not on a plate. The top layer was jam, it was stuck in the paper that flew with the wind. Then I would start with layer number two, One that was eaten before because it was so good. In two half I had shared layer three, when one was eaten, the second was dropped. The fourth was with mayonnaise and tomato, mayonnaise were squeezed out and the tomato was flat. The cheese I had on the last layer, was stuck under the previous that I had eaten. No, it’s no fun to eat this food, when it is in the package and not on a plate. the package and not on the barrel. I love reading your blog. It is fun to see Norway from the outside like this, and you post on so many things that I just take for granted. Hi Ingrid – thanks for the correction. I’ll update it. I did think it was a bit strange with “barrel”. You have taught me a new word! Glad you also enjoy the blog…it’s so much fun learning new things about Norway. Hi! this was/is a very nice blog for me to cross with, because, and it’s somehow funny in retrospective, when I was in Sandnes, Rogaland, working as a ‘maller’ I thought I was the only one tired of having ‘sandwiches’ all day and nyght! In my case I used a lot of rekkersalat and others! The thing is I’ll be back in 19th of October, arriving Oslo arround midnight, leaving Faro, Algarve!